John McCain is being laid to rest at the US Naval Academy in Annapolis, Maryland. 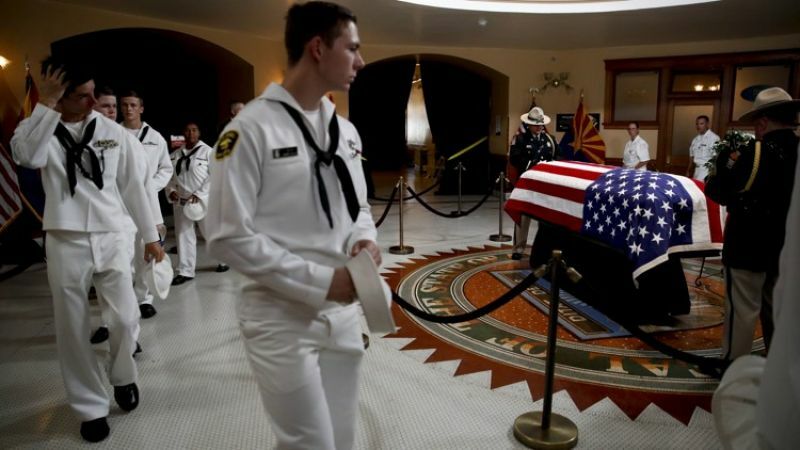 The private burial Sunday next to Adm Chuck Larson brings to a close the six-term senator's cross-country farewell after he died of brain cancer August 25 in Arizona. The procession was carefully designed by McCain as a final call to arms to a nation he feared was at risk of losing its civility and sense of shared purpose. To illustrate the warning, McCain asked former Presidents Barack Obama and George W Bush to eulogize him at Washington National Cathedral. The service Saturday was a rebuke of President Donald Trump's divisive politics. Trump had mocked McCain for getting captured in Vietnam and was not invited to any events. The president spent the day tweeting and golfing.